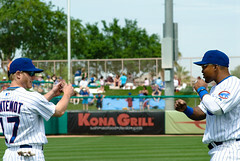 Marlon Byrd is one of my favorite chicago Cubs. He just plays the game the right way. He crowds the plate when he bats to help him cover the plate better and doesn't get intimidated by pitcher's throwing inside, he has finished in the top ten twice in being hit by pitches twice. One of his most memorable moments was being hit in the face with a pitch against the Boston Red Sox. A few videos below of that pitch, a few great catches and a play that many Cub fans will remember in the All-Star game. Caution-graphic video of Marlon Byrd being hit in the face with a pitched ball.